We do not have a health care crisis. Our health-care in this country is outstanding, and particularly here in Eastern Idaho. Portneuf Medical Center and their incredible staff provide superb care, as my family was reminded of just recently. We can’t even truly say we have a health-care insurance crisis. I’ve not seen any better breakdown of the numbers than what Investor’s Business Daily printed a couple weeks ago. They pointed out that 85% of the population, or 258 million people, have health insurance. Of those, 89% are happy with the coverage their insurer provides, according to an ABC News poll. They examined the most reliable figures of an estimated forty-seven million people who lack health care insurance. 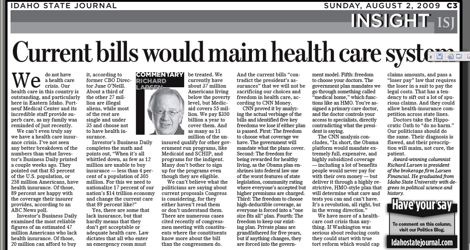 Of those, 20 million can afford to buy it, according to former CBO Director June O’Neill. About a third of the other 27 million are illegal aliens, while most of the rest are single and under 35 and choose not to have health insurance. Yes, there are some that lack insurance, but that hardly means that they don’t get acceptable or adequate health care. Law dictates that all who enter an emergency room must be treated. We currently have about 37 million Americans living below the poverty level, but Medicaid covers 55 million. We pay $350 billion a year to cover them. And as many as 11 million of the uninsured qualify for other government run programs, like Medicaid and SCHIP, and programs for the indigent. Many don’t bother to sign up for the programs even though they are eligible. We can’t believe what the politicians are saying about current proposals congress is considering, for they either haven’t read them or don’t understand them. There are numerous cases cited recently of congressmen meeting with constituents where the constituents know more about the bill than the congressmen do. And the current bills “contradict the President’s assurances” that we will not be sacrificing our choices and freedom in health care, according to CNN Money. CNN proved it by analyzing the actual verbiage of the bills and identified five key freedoms we lose if either plan is passed. First: the freedom to choose what coverage we have. The government will mandate what the plans cover. Second: the freedom for being rewarded for healthy living, as the Obama plan enshrines into federal law one of the worst features of state legislation, community rating where everyone’s accepted but higher premiums are charged. Third: the freedom to choose high-deductible coverage, as everyone is forced into a “one size fits all” plan. Fourth: the freedom to keep our existing plan. Private plans are grandfathered for five years, but if anything changes, they are forced into the government model. Fifth: freedom to choose your doctors. The government plan mandates we go through something called “medical home,” which functions like an HMO. You’re assigned a primary care doctor, and the doctor controls your access to specialists, directly contradicting what the President is saying. We have more of a health-care cost crisis than anything. If Washington was serious about reducing costs they could start with true tort reform which would cap claims amounts, and pass a “loser pay” law that requires the loser in a suit to pay the legal costs. That has a tendency to sift out a lot of spurious claims. And they could allow health-insurance competition across state lines. Doctors take the Hippocratic Oath to “do no harm.” Our politicians should do the same. Their diagnosis is flawed, and their prescription will maim, not cure, the patient.